Take Rivonia Road Turn-off and go towards Rivonia along Rivonia Road. Turn left into Mutual Road and left again into Rivonia Boulevard South. Parking is available in Mutual Village to your right. Take Rivonia Road towards Rivonia through Morningside. 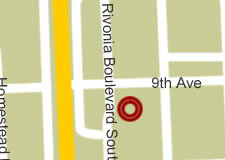 At the intersection of Rivonia Road, Mutual Road and 7th Avenue, turn right. Turn left into Rivonia Boulevard South. Parking is available in Mutual Village to your right.